Markings: (Recto) collection mark of William Young Ottley in the lower right corner. Secondary Inscription: (Recto) at the bottom, inscribed "Aisverris" and "Hester" in light brown ink; (verso) inscribed "Hans Schauffelein/Sir Thomas Lawrence" in pencil. Esther approaches her husband King Ahasuerus, desperate to tell him of a plot to massacre the Jews. As Ahasuerus touches her with his golden scepter as a sign of his good favor, Esther faints with relief. Behind Esther, a crowd of courtiers, compressed into the dark background, watches in open-mouthed amazement at her daring. Frans Crabbe van Espleghem used complex patterns of hatching to create the various architectural and human forms. 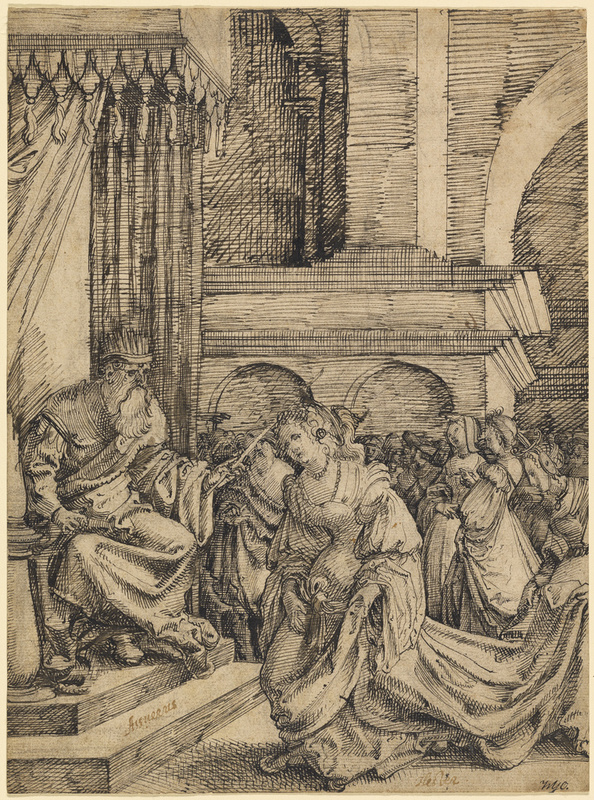 Busy lines of cross-hatching capture the shifting folds in Esther's dress. One of the first Netherlandish artists to experiment with the technique of etching on copper, Crabbe incised this fully worked preparatory drawing for transfer to a copper plate; the drawing corresponds almost exactly in scale to the finished etching.